Have you been through a heartbreaking journey to have children? Read Helen Proctor’s story below. 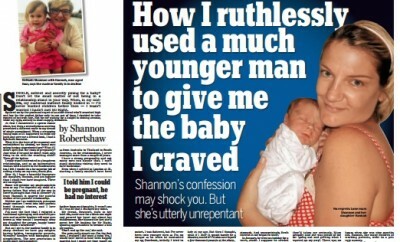 Over the course of seven years she suffered three miscarriages and spent £90,000 on six rounds of IVF. Now, she’s finally a mum! Helen 34, a health care assistant from Southampton, is celebrating the birth of her first son Blake after splashing out £90,000 on IVF. Blake’s birth is miraculous because Helen and her husband Marc, 33, who works for a private security firm in Iraq, have been through six gruelling rounds of IVF to have their baby. Sadly, Helen miscarried twins in June last year but refused to give up on their life-long dream of becoming parents. Despite having a devastatingly low egg count, the couple fell pregnant with twins after their sixth round of IVF in January this year. Heart-breakingly, they lost one of the babies after Helen’s waters broke at just 22 weeks. Against all odds, the other baby survived and although he was born at 23 weeks, before the legal abortion limit, and has now gone home with mum and dad. After rinsing their savings and forking out £90,000 over seven years, Helen and Marc say it was worth the money and pain to finally have a baby. When Helen and Marc got married in 2007, they instantly started trying for a baby. As Marc worked away in Iraq for 8 weeks at a time, they had little chance to try and conceive. Three times a year when Marc was back in the UK, they would try and get pregnant, but after a year of failed attempts Helen decided to get Marc’s sperm frozen and use it while he was away. Saving up enough cash for Marc to take a year off work and spend it in England, the couple started to realise something might be wrong after a year of trying. 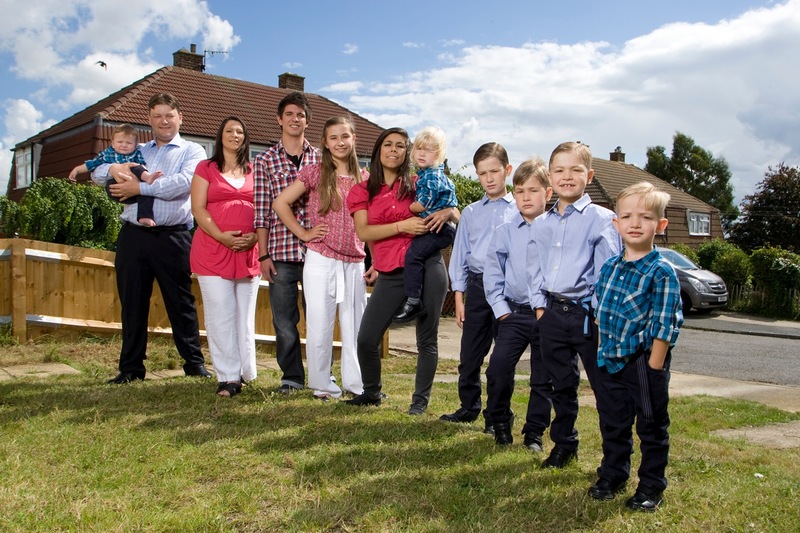 In 2008 Marc came back to their home in Southampton and after ten months with no success, begged the fertility clinic for help. They were told they were being impatient but Helen paid extra for both of them to have a blood test, to check everything was ok. The results revealed that Helen’s egg count was so low it would be difficult to conceive naturally. While an average woman would have 30, Helen had just 7, and the quality of her eggs were the same as a woman in her 40s. Advised to try IVF immediately, the couple had their first cycle in January 2009 costing them £8,000. The first attempt failed and they splashed out another £16,000 that year on another two attempts. It was later revealed that Helen had endometriosis and an inflamed womb and the couple went to a Harley Street clinic for round four – costing another £9,000. For round five they went back to the clinic in Southampton and used their sister clinic in Spain for an egg donor. In March 2013 they flew out to Alicante, Spain and at the beginning of April fell pregnant with twins. Devastatingly, at seven weeks Helen found out one of the babies had died and she underwent a surgical abortion in June 2013, by which time the other baby had also died. 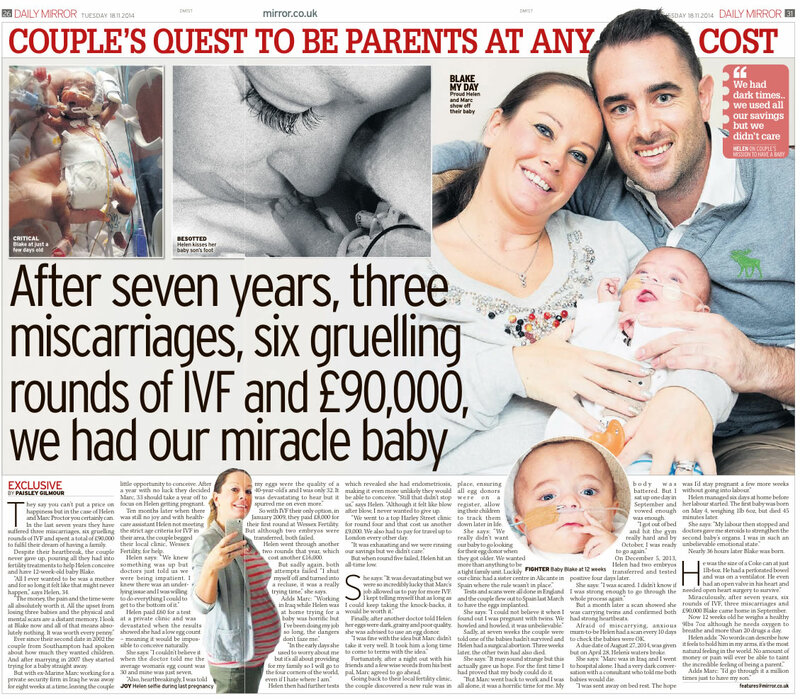 In October 2013, after months of grief and exhaustion, Helen decided it was time to try again and in November 2013, the desperate pair flew back out to Spain and in January 2014, had a scan that confirmed they were pregnant with twins again. The babies were due on 27th August 2014 but at just 22 weeks, Helen’s waters broke. As Marc was in Iraq she drove herself to hospital and although doctors tried to prolong her labour, their first baby was born on 4th May weighed just 1lb 6oz. Sadly, he only survived for 45 minutes. Helen managed to hang on for another 24 hours and the following day, Blake was born and was the size of a coke can. Their miracle son survived an operation on his bowel and open heart surgery at just a few weeks old and has defied doctors’ predictions. Features editor Paisley placed Helen’s story with The Mirror and we’re in the process of securing the pair TV and mag deals. Have you been through a heartbreaking journey to have a baby and would like to share your experience? If so, please fill out the form on the right or email [email protected] for more information. One of our team will get back to you ASAP and please don’t contact any other agencies or publications directly whilst we’re trying to secure you a deal. For other examples of stories that we’ve recently sold to the press, see our Latest Stories Page. ← Previous Story Addicted to Laxatives!